Colt M1911A1 U.S. ARMY Serial Number 890199 (parkerized finish) - Shipped March 25, 1943 to the Transportation Officer, Springfield Armory in a shipment of 2,000 guns. 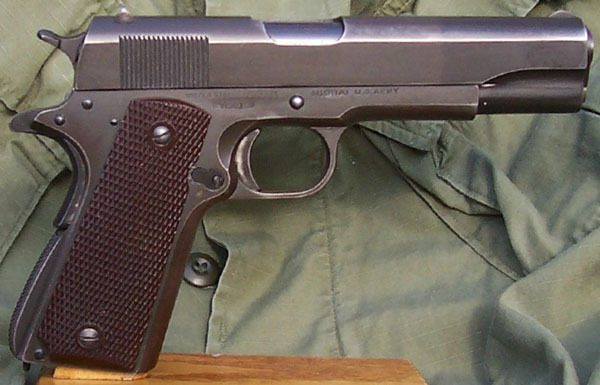 One of 106,171 model 1911A1 pistols produced with a duplicate assigned serial number. It is speculated that the duplication in serial numbers occurred as a result of confusion during the rapid expansion of the ordnance operations in 1941. At this time, small arms contracts were transferred from Springfield Armory to the Office of Chief of Ordnance (OCO). Springfield failed to notify the OCO of previous serial number assignments. The serial number blocks 801001 - 958100 and 1088726 - 1092896 has been assigned to Colt and were recorded in their production ledgers. At the same time,. the OCO assigned the following serial numbers blocks when they were under the assumption that the high serial number assigned to Colt was 856100.